Am 05.05.2004 nahm die hochauflösende Stereokamera (HRSC) auf der ESA Sonde Mars Express im Orbit 368 einen Teil des südlichen Hochlands des Mars mit einer Auflösung von 14 Metern pro Bildpunkt auf. Die Abbildungen zeigen ein Gebiet in Promethei Terra östlich des großen Einschlagbeckens Hellas Planitia. Das Bildzentrum liegt bei 42° südlicher Breite und 118° östlicher Länge. 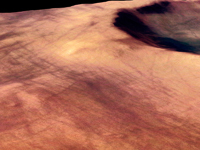 On 5 May 2004 the High Resolution Stereo Camera onbard the ESA spacecraft Mars Express took image data of a part of the southern Highlands of Mars. The images show an area in the Promethei Terra region east of the Hellas Planitia impact Basin. 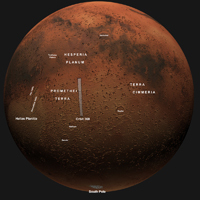 The image center is located at 42° southern latitude and 118° eastern longitude. The data were taken with a ground resolution of about 14 metres per pixel during Mars Express orbit 368. The smoothed surface in this area is caused by a layer which up to several tens of meters thick. This layer covers all landforms, even young impact craters loose their contours rapidly due to dust infill and collapse of the fragile crater walls. It consists of dust or volcanic ash. This layer has been removed at ridges and crater walls (see close-up 1). Although the image was taken at highest resolution and shows very fine detail like the dunes (see close-up 2), this layer leads to a slightly fuzzy appearance of the scene. The large impact crater in the southern part of the image has a diameter of about 32 kilometers and a depth of up to 1200 metres. The dark crater floor is most likely the result of deflation, the dust removed here has accumulated in the southern part of the crater, forming a thick layer. The numerous dark tracks in northwestern and western direction are dust devil tracks. These eddies remove the uppermost dust layer which has a slightly different colour than the now- exposed surface. The tracks can be more than 20 kilometers long and contrast prominently to the lighter- coloured surroundings. The dust devils are not limited by geomorphological boundaries, for example, their tracks are crossing the crater rim. On the thick dust layer in the southern part of the crater, dust devil tracks can be seen. Due to the thickness of the layer, no darker material is exposed here. The dust devil tracks show two distinct directions of movement, east - west and southeast- northwest. Dust devil tracks are the short - lived witnesses of the ongoing geologic and atmospheric activity on Mars, which consists mainly of the transport of dust by wind. Another sign for the eolian activity in this area is the existence of small dune fields which have formed in some of the depressions. They can be seen in the crater in the north and in its surroundings (see close-up).